When I hear the words "granny" and "apple" in the same phrase, I naturally think of Granny Smith apples—especially when I see that lovely shade of light green. 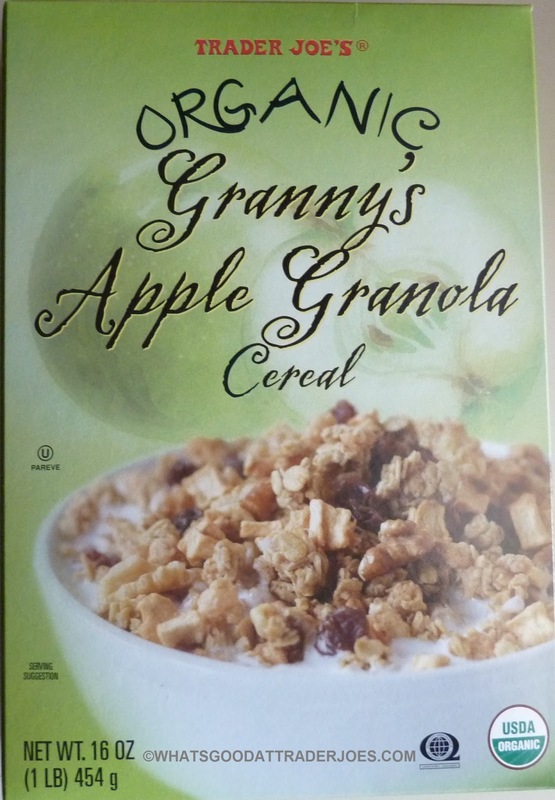 And although the ingredients don't specify what type of apples are used in this product (just says "organic dried apples") I'm pretty sure they're not Granny Smith. But that's not a bad thing in this case. I'm thinking Granny Smiths would have been too sour. The apples we find here are nice and sweet, and they mix very well with the organic oats sweetened with organic milled cane sugar. I was actually pretty pleased with the amount of apple bits throughout the cereal. There were walnuts, too, but those were fairly sparse in our box. Apparently Sonia wishes there were more pieces of apple. Her comment: "I wish it had little pieces of apple in it." My reply: "It does." Her next comment: "Hmm funny I don't remember eating them. But then again I am a little weird." Oh, Sonia. In her defense, though, they do blend in pretty well with the rolled oats and other granola ingredients—visually, as well as flavor-wise. Strangely, she still liked it enough to give it four out of five stars. It's a solid, hearty, granola-based cereal. 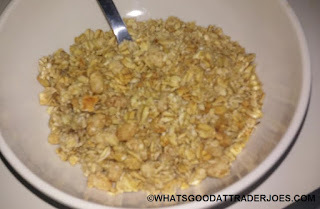 Just think of any other granola cereal you've had from Trader Joe's or anywhere else for that matter, and throw in some dried apple bits, and that's pretty much what you have here in terms of taste and texture. Considering it's completely organic and naturally-flavored, I can't go lower than four stars either. Like Russ's last post, this product has been a mainstay on that TJ's cereal shelf for at least four or five years now—but we just tried it for the first time this past week and we're here to tell you that it's worth a purchase. It just might wind up on your grocery list week after week.